When is an artichoke not an artichoke? When it is a Jerusalem artichoke, also known as a sun choke because its flowers look like sunflowers. You eat the flower buds of the true artichoke, Cynara scolymus, which is in the thistle family. You eat the swollen underground portions, the tubers, of the Jerusalem artichoke (Helianthus tuberosus). Growing Jerusalem artichokes can be very easy, too easy in some parts of the country. Interestingly enough, it is native to the Northeast U.S. where it is also considered a huge pest because of its hard to contain rampant growth. Jerusalem Artichokes grow best in the cooler areas of the country. They should be planted as soon as the ground can be worked in the spring, about the same time as potatoes and peas. With this in mind, you should not let it loose in your garden for fear it will take over. You can still grow it for its nutty sweetness without fear if you plant it in a deep container, at least 12 by 12 inches, deeper would be better. Space the tubers about 3 inches apart. They will thrive in a mixture of compost and good garden soil that holds moisture but doesn’t stay wet. Remember, these plants get over six feet tall. Add stakes to support the stalks as they grow and put the pot in a sunny area. According to the North Carolina State Cooperative Extension Service, “Whole tubers or pieces of tubers that are no less than two ounces and have two or three prominent buds should be planted. Smaller seed pieces will reduce yields but larger seed pieces (over 2 oz) will not significantly increase them. Do not allow cut seed pieces to dry before planting. Plant 3 to 5 inches deep.” You can plant food Jerusalem artichoke pieces that you buy in the supermarket or from a grower or you can order seed from a vegetable catalog. Since there are very few (to none) pest problems with these artichokes, there is no need to use any pesticides on the plants. If the plants look small or spindly, then add a fertilizer with a high middle number, which will promote good root growth. 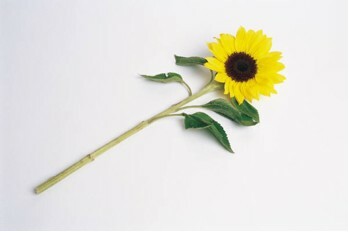 Cut off any flowers before they have a chance to go to seed. If you allow seed to set, you still could have them self-sow in your open garden. For the best sweet taste, wait until after a frost to dig out the tubers. Store them in a refrigerator vegetable drawer that has humidity. Peel and slice them to use as you would a water chestnut in salads or soups, or chopped in Chef Linda’s great recipe this week for artichoke relish.